I woke up this morning with my twitter notifications flooded with over fifty mentions, ten new book sales, and a sense that something definitely happened overnight while I was sleeping. The crazy thing about living in Thailand is I'm awake while the rest of the world is asleep and vice versa. I also don't have any notifications active on my phone and don't check email or social media after I close my laptop for the day so I never know what's going on until the next day. This crazy time zone difference has forced me to setup my business to be semi-passive and completely location independent. It's common for me to build during the day and make all of my sales overnight while i'm asleep, for my books, courses, and dropshipping stores alike. Here's a link to the article, how I got featured, and what my life is really like. If you haven't already, read the article on Business Insider here, or keep reading below for the "Johnny FD Insider" on the write up. How True is the Article? "Tell me about yourself? How did you get started? Etc." But she already knew all of it. It turns out Business Insider is super legit when it comes to gathering facts and doing research. Reading the article I'd say pretty much 100% of it is spot on and she didn't take any of my quotes out of context. Most people would assume that since my books, blog, and online stores are less than two years old that my success and this story started overnight and snowballed from there. But the truth is, if it wasn't for the five years of living on a tight backpackers budget, getting paid less than $30 a day taking tourists underwater on up to 4 dives a day which often equates to getting paid $3.75 cents an hour. 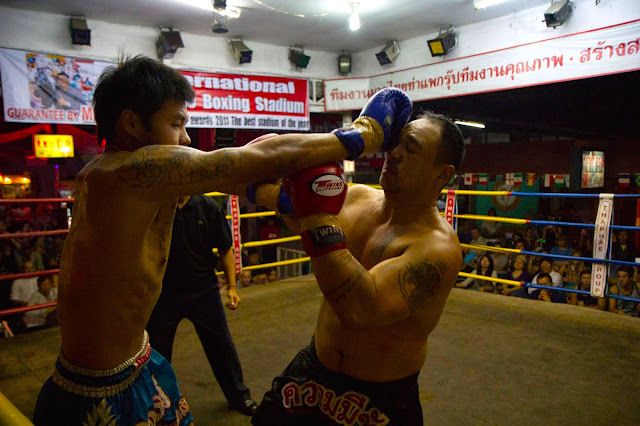 Then there was stepping into the ring and fighting Thai guys who have been training since they were 8 years old and getting my nose broken often for free training at the Muay Thai gym or a bamboo mat on the ground to sleep on. The most I ever got paid for a pro fight was 5,000 baht, which was less than $150, half of which I gave to my corner man and trainers at the gym. It was a struggle, but I loved everyday of it, as it beat commuting to a job I hated, and being unmotivated knowing that there wasn't anything to look forward to expect getting drunk on weekends and the once a year weekend trip away. If it wasn't for me documenting the struggle and journey of "Living the good life on the cheap" in my first book "12 Weeks in Thailand," I never would have had the courage to give entrepreneurship a try. It was a big decision. I had finally figured out how to make money online while traveling and living in Thailand, and it was enough to replace my 9-5 salary back home. The decision came to whether or not I should keep my mouth shut not to create too much competition, or if I should tell the world about dropshipping and that it actually works. I ended up saying f$%* it and wrote this open letter asking my friends and family to start their own as well. I honestly thought that all of my friends who I personally messaged, called or even saw in person would follow through but till this day, only a handful actually did. One of which is my best friend Chris Lioe who is sitting across from me here in Chiang Mai, Thailand today. It was because I decided to openly share my success with dropshipping that my blog and podcast went from only a few close friends and family reading and listening to having tens of thousands of views and downloads today. If it wasn't for me deciding to risk it all and openly talking about everything that is working for me, I never would attracted the Business Insider article. 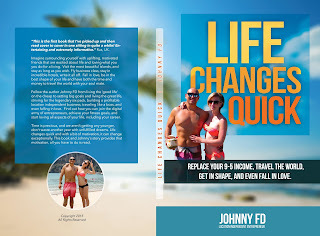 I had a couple of choices, I could have focused 100% of my time creating multiple dropshipping stores in different niches and becoming the next Amazon, Wayfair or Hayneedle, but instead I focused my energy on maintaining my own store and just making enough money to continue traveling, enjoying life, and having enough free time to help inspire others. 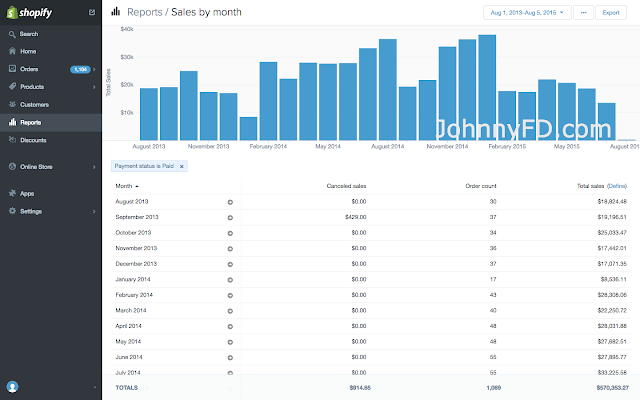 In my progress thread in the private member forums of the course, I have over 700 replies where I've documented everything I've done to start my store and helped hundreds of others with their own. 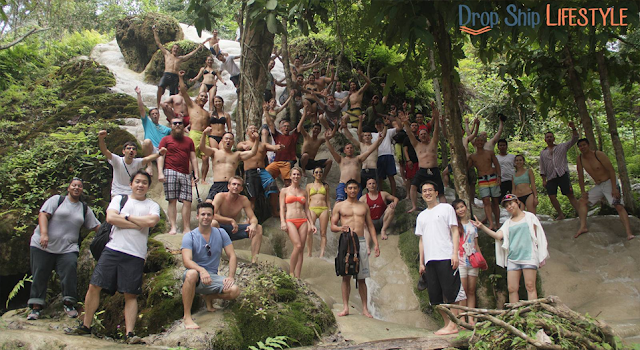 At the end of 2014, I met 120 of them in person at the first annual Drop Ship Lifestyle Retreat here in Chiang Mai Thailand and realized then how many people have followed in my footsteps and started their own successful stores. It was because so many other people actually made money following my recommendations to join the course and the fact that I stuck around to answer their questions in the member forums afterwards that I've gained a positive reputation and the trust that only comes after years of being earnest, which was another reason why the editors at Business Insider were comfortable enough to feature me. I wanted to create a course that would teach everything I know and personally do to grow my blog audience, and make money online. The core of it is simple, you can earn affiliate commission by recommending books, services, online courses and products to your readers. The course would teach people how to start a blog or website, find and get approved by affiliate offers, get traffic and start making money online. 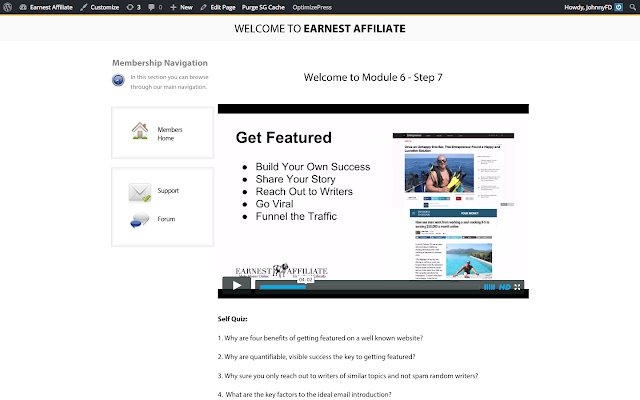 Launching my course Earnest Affiliate would either create tons of competition as I show some pretty confidential stuff in my case studies, or it would create an entire new stream of income and an army behind me to support whatever next venture I get into. It's still a bit early to tell which way it's going to go, but it's gambles like this that I've taken in the past that have paid off, and got me featured in articles like this. "What do I wish existed when I was sitting in my soul-crushing cubicle, and what would help that guy the most?" Celebrating success with the love of my life, Larissa. I would say, just email the editor at Business Insider, Elite Daily, or whatever other publication you want to be featured in and ask if they want to do a story on you. Or just have a well written contact me page and make it easy for media outlets to find and interview you. But in reality, you are better off spending your time becoming successful yourself, creating your own story whether it be how a 40 year old school teacher quit her job and traveled to all 196 countries in the world, or how a 22 year old dropped out of college and made your first million online. I'm sure there are some other tricks and tips that can help, which is why I'm going to create a new traffic module in my course using this article as a case study, but first focus on becoming as successful as possible and living an extraordinary life. If you want to know more details and how to do it yourself step by step, join my course Earnest Affiliate, where one of the new traffic modules is an in depth case study that shows the exact emails Libby and I sent each other back and forward, her actual email address, how to find other writer's contact details, how to approach them, and how to turn 1 article into features on 10 others. Here's the tweet that started it all! Do me a massive favor and help spread the word by retweeting the write up. I hope you got a lot out of this blog post, and hope that my story has helped inspire you to take control of your own destiny, create a job that you love, one that lets you be location independent and travel the world. First of all, congratulations on getting featured Johnny! It's a great achievement. I've signed up to your site so I'm looking forward to learning about your journey. I've recently decided to leave my job in favour of a location independent lifestyle, and like you, Thailand is high up on my destinations list. Hey Fabio, thanks so much for the kind worlds. I was really excited when I woke up and saw that I had been featured. Best of luck with your move to Thailand, let me know how your business goes! Excellent job, Johnny! Your story is very inspirational! A couple of questions. 1.) Why do you think that friends and family have been so hesitant to make the leap? What mental blockades could be stopping them? It's been my experience that people create lame blockades in their mind that could easily be broken down if only they would focus on action. Still though - why wouldn't someone so close to you want to emulate your business model? 2.) Did Business Insider not tell you you were for sure going to be featured? 3.) Of those you've encountered since adopting the abudance mentality (over the scarcity mentality) what percentage have been equally generous with you? (I admire your abundance mentality by the way). I think my friends and parents were just worried. I wrote about the initial move in detail in my first book 12Weeks in Thailand. Even if 99 out of a 100 people I give value to never end up returning it, it doesn't matter as value is an infinite resource and scalable. So if I reach 100,000 people I'll have 1,000 people returning it which is amazing. Got the best platform for lending loans while being at home which I was looking for almost a decade and believe me I am not disappointed a bit! Great opportunity at Guarantor! Five Stars!